PHILADELPHIA, PA – October 9, 2018 – Janney Montgomery Scott LLC (“Janney”) is pleased to announce that Clare Schwemlein, First Vice President/Wealth Management of The Schwemlein Group in Chillicothe, OH, has been named to Working Mother magazine’s 2018 list of Top Wealth Advisor Moms. The list, featured in the publication’s October/November issue, recognizes the top 300 mothers working in wealth management today. 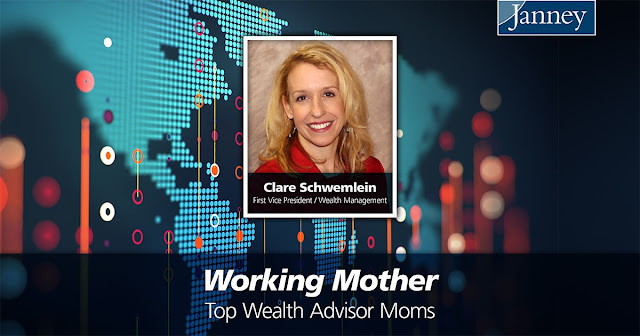 Working Mother’s Top Wealth Advisors Mom list is compiled by SHOOK Research, which considered wealth advisors who are mothers with at least one child under the age of 18 and have a minimum of $70 million in assets under management and five years of wealth management experience. Nominees were evaluated based on qualitative measures derived from telephone and in-person interviews and surveys: service models, investing process, client retention, industry experience, review of compliance records, and firm nominations; and quantitative criteria, such as assets under management and revenue generated for their firms. Clare has more than 10 years of experience in the financial services industry and has achieved the advanced designations of Accredited Wealth Management AdvisorSM (AWMA®), Certified Employee Benefit Specialist® (CEBS®), and Certified Financial Planner™ (CFP®). As a CFP®, she provides investment advice to individual, corporate and institutional clients for retirement planning, trusts, education savings, charity and estate planning, stock options, private money management, insurance and other areas of investing. With a background in Human Resources, Clare also specializes in benefits and management consulting. Clare is the founder of a mothers’ networking group and a contributing author to the Chillicothe Gazette, where she submits monthly financial articles. A graduate of Marquette University, she holds a Bachelor of Arts degree. Outside of work, Clare enjoys spending time with her four children – a ten-year-old son and eight-year-old triplets – and is an active runner and triathlete.